Noel Fessey is CEO, chairman of the Executive Committee and member of the Board of Directors of European Fund Administration, based in Luxembourg. 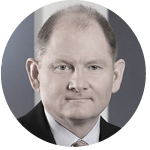 After a military career, Noel worked for Schroders in London, and from 2003 to 2016 he was Managing Director and Country Head of Schroders Luxembourg. Noel was a member of the board of directors of the Association of the Luxembourg Fund Industry (ALFI) from 2005 to 2016.